3 Bed Cabin Nestled In The Appalachian Foothills. Privacy & Peace Are Here! Welcome to this Cool Cabin Stuff Retreat. Holly is my wife of 27 years, and I, Harry Boyd, have been a builder of cabins and cottages along with a hunting and fishing guide for years, guided fishing tours available! Home has fishing tackle. We are opening up one of our Cabins to share with you , your family or friends. The Retreat offers 3 bedrooms, 1 full bath and a 1/2 bath upstairs, fully-equipped kitchen with dining area, living room and a separate area with washer and dryer right inside the back door. The Retreat has a nice porch, with animal feeders and bird houses overlooking a beautiful ravine and NO neighbors but plenty of wildlife to enjoy with your morning coffee! Watch wildlife from your porch, relax with the birds, and there is great fishing located less than a mile down a dirt road! This 98-acre reservoir that has 500 acres of woods for hiking or fishing with no houses around it. The lake is electric motors only. A clean lake where gas motors are not permitted makes canoeing and fishing all that much more enjoyable. There is also outstanding fishing on the Ohio River nearby that offers great fishing with piers pavilions and restrooms. The end of March every year the state stocks the reservoir with thousands of trout that are a blast to catch and has a wide a variety of game fish that are very good to eat with the cleanness of the water. You will be close to Piedmont , Salt Fork, Seneca Lake, Wolf Run and Monroe Lake and wild life areas. We have a fire pit area (with a swing!) for cooking your catch or just kicking back and enjoying the peace and stars If hunting is what you like we have thousands of acres within 20 miles of the Retreat also. If you like antiques, Barnesville has several large shops to visit and several craft shops and close to a local hospital, shopping and fuel. So if you are looking to get a way from the crowds and unwind with nature give us a call. This secluded 3 bedroom home is all cabin except the siding outside. Rich, warm pine walls, ceilings with all the amenities of home. Just bring your food and get ready to enjoy nothing but the sounds of nature! There is a creek with bridges and mature trees on these foothills of Appalachia so the kids can run free on the paths! Your Cabin Retreat has a complete kitchen, fully-furnished, there is a large flat screen TV in the living room, with Dish network to be enjoyed as well as a gas fireplace. Verizon does work for us, but while you're here, plug into nature! Most of the traffic on this dirt road you will see... will be Amish buggies! The size of The Retreat can sleep 6 people, but there is a $50 fee for each adult over 4 people It is non smoking only and pets are not allowed. We moved to the Ohio Valley to GET AWAY FROM THE NOISE! We love it down here and want to share the peace and quiet with you! We lived our younger years working hard, stressed out and then decided to GET OUT. Harry is an avid hunter and fisherman that can show you everything around here! Harry and Holly have been married since 1990, 3 kids and 2 grandchildren. Our friends built this as their retreat, but then they moved! This awesome cabin has never been lived in, we only rent to friends... and now YOU! There aren't many places like this left, no neighbors, no noise. You won't want to leave, but you can come back! It's the most peaceful place around, yet close to whatever you need. Just a couple hour drive from Cleveland, Akron, Columbus and 30 min from Wheeling WV where they have Casinos! Six miles south of town, you will think you are 100 mikes away. So quiet on a dirt road! So peaceful! The Village of Barnesville Ohio is known for its antique mall and the famous Pumpkin Festival the last weekend in September. It is a charming, quaint town where you can walk to craft shops. 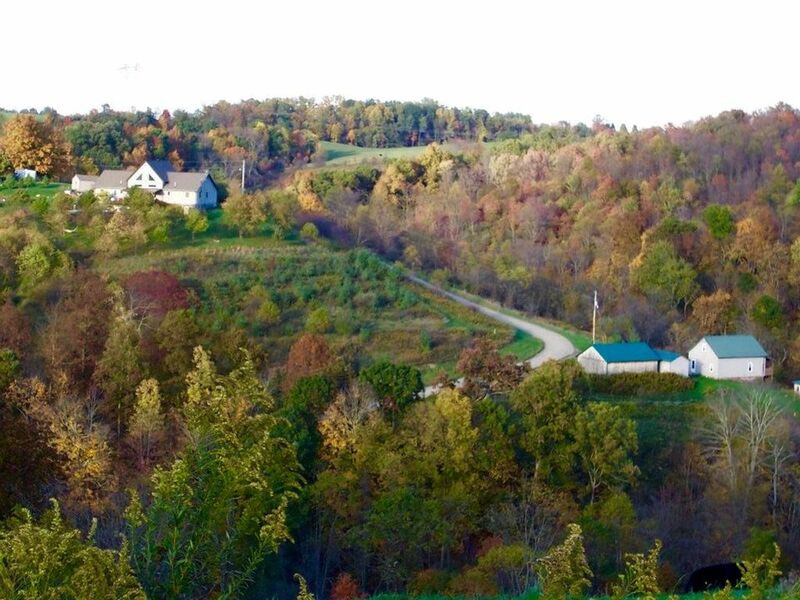 We are located at the foothills of Appalachia and among some of the most scenic places you will ever see! You can hear and see the creeks on 2 sides of the cabin from your back deck! You need not bring anything but the food you want to eat, although i always keep food there too for you. Oils, sprays, seasonings, coffee all here for you! You need to bring nothing, have all dishes, pots pans, foil, silverware, paperplates, JUST LIKE HOME. YOU HAVE NO NEIGHBORS HERE, sit and enjoy the PEACE on your back deck facing the forest. You are 30 -45 minutes from Wheeling Island of WV with Casinos! The property is well kept and beautifully decorated. The beds and furniture are comfortable. It’s peaceful and relaxing! We enjoyed our stay. Thank you! We loved having you and you cleaned up like you weren't even there! Thanks for choosing The Retreat! Come on back! Visited with a group of friends to relax and enjoy some hiking and scenic driving. We were all impressed by how clean and well stocked the cabin was. There are numerous parks to visit nearby and we enjoyed driving around and exploring the area. Harry and Holly are great hosts and really went out of their way to make us comfortable. They brought over a bottle of wine for us to share, gave some hints on interesting places to visit and even lent us some tools to help fix a broken fuel pump on one of our cars. Overall a great experience that was really above our expectations. 😊 we loved having you down and we surely hope to have you back! Peaceful, wonderful view, place you can go to and regroup after a hard week at work. Thanks Tom! We love to share the Peace, come on back! And thanks for cleaning up so well WOW! My husband and I really enjoyed our lil weekend getaway. The cabin was clean, comfortable bed, living room furniture, and well stocked kitchen. We met Harry and enjoyed our conversations, he filled us in on many fishing spots,and "tricks", even offered us some of his own lures!! We enjoyed a day of fishing on the nearby reservoir , and also Seneca Lake. We would definitely consider visiting again.!! Thank you for coming! I (Harry's wife Holly) just had the flu shot... and it made me sick so I regret that I could not meet you myself, but I look forward to that next time! Thanks for leaving the place so clean!! We are a gorgeous 45 min drive from the Casino on Wheeling Island the the famous Oglebay Park with Zoo and horticultural splendor everywhere!